राष्ट्रवाक्य: Libertad o muerte (स्पेनिश)"स्वाधीनता या मौत"
↑ अ आ Bureau of Western Hemisphere Affairs. "Background Note: Uruguay". US Department of State. अभिगमन तिथि 23 February 2011. ↑ "THE STRUGGLE FOR INDEPENDENCE, 1811–30 – Uruguay". Library of Congress Country Studies. अभिगमन तिथि 23 February 2011. ↑ "Google homenajea a Uruguay". El Observador (स्पेनी में). 25 August 2012. अभिगमन तिथि 23 August 2018. ↑ "Uruguay in Numbers" (PDF) (स्पेनी में). National Institute of Statistics. मूल (PDF) से 13 November 2013 को पुरालेखित. ↑ अ आ इ ई Central Intelligence Agency (2016). 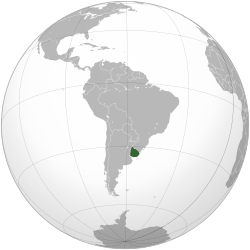 "Uruguay". The World Factbook. Langley, Virginia: Central Intelligence Agency. अभिगमन तिथि 1 January 2017. ↑ अ आ "Climate – Uruguay". Library of Congress Country Studies. अभिगमन तिथि 23 February 2011. ↑ अ आ इ "Business Guide" (PDF). Uruguay XXI. मूल (PDF) से 1 May 2011 को पुरालेखित. अभिगमन तिथि 25 February 2011. ↑ "The Economist Intelligence Unit's Index of Democracy 2012". मूल (PDF) से 3 January 2015 को पुरालेखित. अभिगमन तिथि 20 June 2014. ↑ "The democratic routine". The Economist. 2 December 2010. अभिगमन तिथि 23 February 2011. ↑ "Censos 2011 – Instituto Nacional de Estadistica". Instituto Nacional de Estadística. मूल से 12 January 2012 को पुरालेखित. अभिगमन तिथि 13 January 2012. ↑ अ आ "Uruguay has 3.8 cattle per capita, highest in the world". MercoPress. 30 July 2007. अभिगमन तिथि 24 February 2011. ↑ Singer, Paola (6 November 2008). "José Ignacio, an Uruguayan Resort Town That's Chic, but So Far Not Famous" – वाया NYTimes.com. ↑ Narayan, Ammachchi. 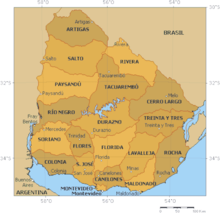 "Nearshore Americas Publishes Exclusive Report on Uruguay's Outsourcing Strengths". Nearshore Americas. अभिगमन तिथि March 23, 2016. ↑ "Uruguayan software industry stands out in the first International Fair on Trade in Services in Beijing, China". ↑ Narayan, Ammachchi. "software and Mobile Services Propel Uruguay to Over $600 Million in Exports". Nearshore Americas. अभिगमन तिथि February 27, 2013. ↑ अ आ इ ई उ ऊ "Uruguay". Encyclopædia Britannica. 2008. अभिगमन तिथि 2 September 2008. ↑ Pelayes, Héctor Darío (24 September 2010). "ARGENTINA-URUGUAY Matches 1902–2009". RSSSF. अभिगमन तिथि 27 April 2011. ↑ "Paris, 1924". FIFA. मूल से 15 June 2010 को पुरालेखित. अभिगमन तिथि 27 April 2011. ↑ "Amsterdam, 1928". FIFA. मूल से 15 June 2010 को पुरालेखित. अभिगमन तिथि 27 April 2011.